Wooden board construction (drawer is moulded) with shiny printed laminated design. Ring holders & mirror on inside lid. Clockwork wound from the back, open the lid & the ballerina figure revolves as music plays. 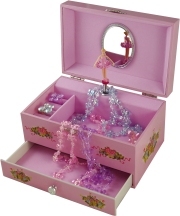 A beautiful larger jewellery box with ring holders, compartments & pull out drawer. 'Eloise' is finished in glittery pink with ballerina & roses design. 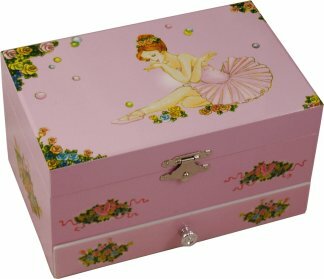 Open the music box to reveal the pink velvet interior & watch the ballerina figurine twirl to the enchanting music.